One quote from Rod's post that is up now, "In addition we all got a good look at a couple of trout over 25 inches that the Damsel worked hard for, got them to take and then found out that 6X makes for some interesting battles with the big guys. I believe the quote was jokingly "This ain't Montana Emily, leave the 3X in the car", but to see her eyes when that big old boy rolled up on the surface and we all got a look at him was priceless! Sometimes a fish lost is the most lasting memory!" See you back here in a few days for the wrap up of an incredible journey. Lots of fun Emily! 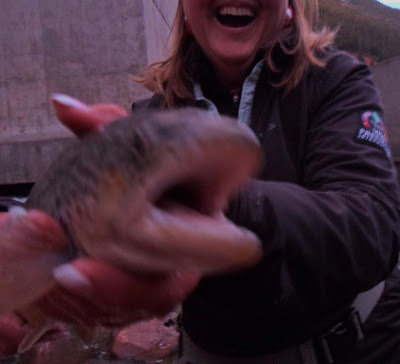 Both Lisa and I really enjoyed our time with you and I have to say you were the picture of patience when we put you on the small flies and skinny fluoro. You hung in there and increased your catch each day and that is just another aspect of the sport you've now experienced. Had a wonderful time, but this old man is still trying to catch up! You youngsters wore me out. It was a great trip... I had a blast that night at the toilet bowl high fiving the the drag truster!... I big highlight to this trip for me. Josh ~ I can't tell you what a treat it was to meet up with you and fish this river together. Your expertise was so helpful at the "bowl" and I brought in another piggie on Sunday with all of your instructions in my head. Whoooooohoo! It was certainly an enjoyable time learning and improving with new techniques. Thanks so much. You know, I would have tried a little harder if I'd of known you you going to bring cookies. Looks like you picked up a few tricks while you were there. Oh Howard... I know many fly fishing tricks now. = ) The snickerdoodles will have come out again for another trip when you are there! I love that picture of you above. Even though it is a little blurry, I think it captured the moment quite well.